Like many organizations throughout the area, Team One employees, pictured above, are in the holiday giving mood. Pictured are: Left to Right: Nicole Bannister, Brianna Rudgers, Laurie Rourke, Julie Watson, Andrea Ball, Norah Harding, Amanda Stone and Katie Dunn. 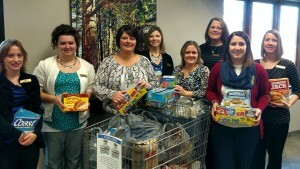 The Team One employees conducted a food drive for Eva’s Place Shelter and have donated a grocery cart full of groceries! Officials at Eva’s Place were extremely thankful, saying, a “Big thanks” to Team One for their donation and their support for Eva’s Place families!